Ububele, in collaboration with Pessl Instruments Austria, implemented this system on an exclusive basis for the Yield Group of companies. In addition, the company’s recent acquisition of Turf-Ag Products, a company that imports and distributes agricultural and turf irrigation equipment throughout the country, compliments this monitoring service. This is a valuable addition to Ububele’s service offering and to its ability to partner with its extensive base of farmer customers to encourage more effective farming, thereby enabling them to become more competitive and to increase their sustainability for the future. By implementing the climate monitoring system, a farmer can potentially save up to 60% on water costs. A saving of this magnitude cannot be ignored. Most farmers rely on innovation in all fields of agricultural sciences to offer solutions to the challenges presented by the ever-growing food scarcity challenge. So far, Ububele has installed five operational climate monitoring system clusters to provide its clients with accurate, up-to-date weather information. Each cluster consists of one main weather station and five secondary stations that monitor soil water content. The five clusters are situated in Kroonstad, Koppies, Christiana, Wolmeransstad and Lichtenburg. The company will install around 70 further clusters across South Africa over a three-year period. 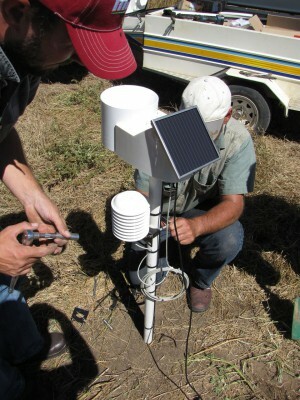 The instruments supply farmers with accurate, real-time information on water, levels of moisture in soil, leaves, air and wind. They also measure precipitation, atmospheric pressure, humidity and temperature, wind speed and direction, collecting all the vital data required for the efficient management of crops. This data is then available through a website: www.fieldclimate.com in near real-time, where customers can log in from anywhere. Each climate monitoring cluster has an early-recognition and warning function, which helps to plan, control, and manage complex weather-dependent processes. For example, they measure soil water content at six depths, which enables farmers to know exactly how much water is available to the plants during the growing season. This will result in better irrigation scheduling throughout the season. 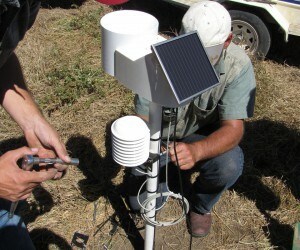 Moreover, soil temperatures are measured, which will assist farmers regarding planting times. Further parameters include frost warnings, five days detailed weather forecasts, disease modelling and consequential optimal spraying times to name but a few. We intend to use this vital data and collaborate with universities and other research institutes to study the impact of climate in our farming regions.